Welcome to another instalment of Miniature Showcase Friday. Been a few weeks since the last one and this one has been a few months in to the making. I am so glad I got to ask Chris Tomlin off the Black Sun a few questions about his Brutes. If you have seen them in the flesh, you will appreciate just how much has gone into making them look war torn and 'ard looking! 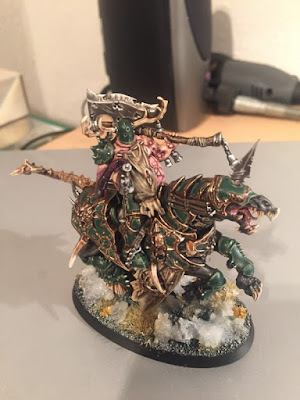 I ask him below a few questions of techniques, colours and choices, as well as a few more questions about the AoS scene and what he is doing next. Hope you enjoy! Sean: Good Afternoon Chris! How are you today? Chris: Afternoon! I'm all good...although this weekend has gone far too quickly, which may have something to do with Final Fantasy XV!! Before we get going, I really, *really* need to apologise for my inability to take photos. Sean: So I have really wanted to get you on, I have been following your blog on tga and love the progress you have been making on the Ironjawz. 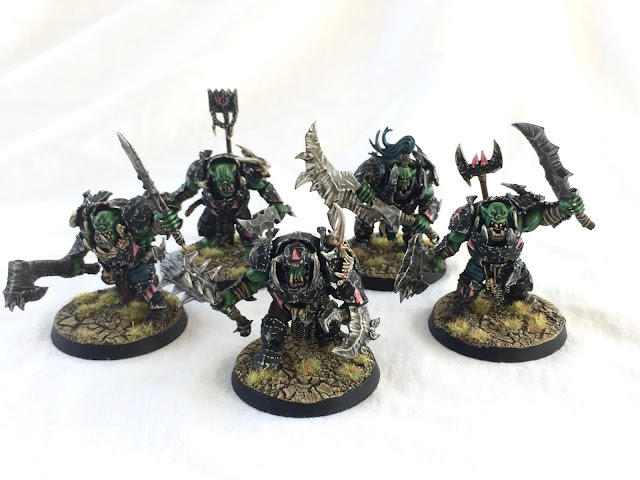 I really wanted to feature the Brutes (some of my favourite models in general) and get down to How you go about painting them, Your basing techniques for the army, your fluff behind them and also the future of your destruction alliance! So I think the first thing I should do is ask, why Ironjawz? Chris: Simply put; the models. 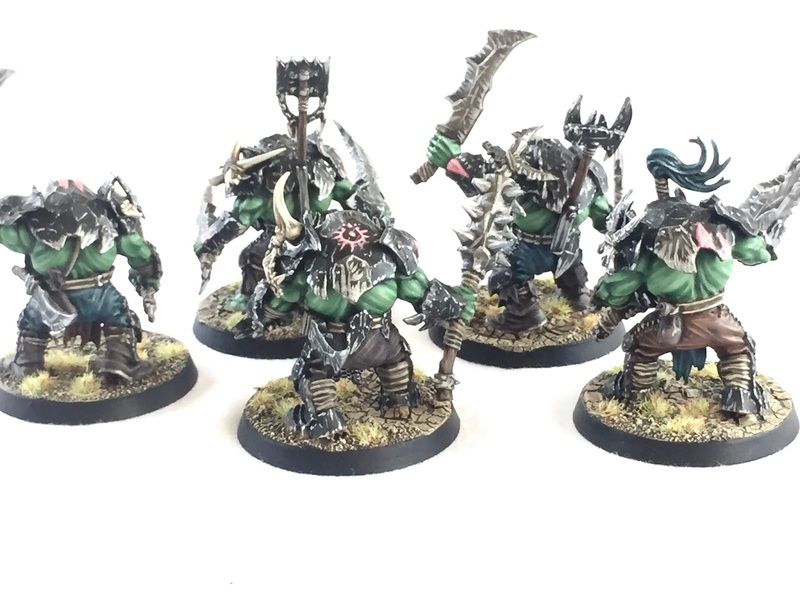 The Ironjawz range is fantastic, arguably GW's best ever. As soon as they were leaked online I knew I had to have them (despite trying to tell myself otherwise for a short while!). 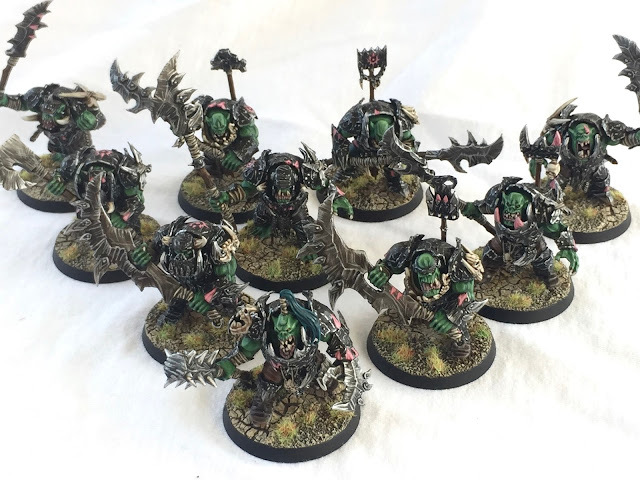 The pseudo 40k vibe on some of the models was a downer for some people, but was a extra draw for me as I love the 40k Ork aesthetic (and own an army), but was never tempted with Orcs & Goblins in WFB. So yeh, spot on for me. Sean: Your skin tones look so good, the shades and highlights really make the model pop. Even muscle definition on their backs, what is your process for creating this Orruk Skin? What paints and techniques do you use? Chris: Firstly, thanks and I'm super glad you mentioned the backs! Oddly I kinda think the models look better from behind. The muscle definition there is great and the trouser backs paint up super nice as well. As for how I go about painting the skin, I would sum it up in one word; inefficiently. I used this method on some 40k/Gorkamorka Orks and as I liked the end result decided to replicate here. The issue is that the colours picked were just selected from the paints in my collection and perhaps do not transition from one another as well as they could. I suspect that you could achieve a similar result with near to half the stages if you were a bit more savvy. At this point I increasingly add Screaming Skull to Warboss Green for 3 top highlights, mostly on raised areas like the faces, knuckles etc. If need be I do a very thinned down glaze of Warboss Green at the end. So yeh, a little time intensive, but it works for me. I should note that I dilute all my paints with Lahmian Medium instead of water at all stages. I love the smooth application and finish this gives. Technique wise I referring to it as layering (I know some people will tell you all painting is layering, but whatever!) as opposed to blending. There's a lot of line/edge highlighting used across the army which is a technique I kinda just fell into recently. Again it can be time intensive, but with a steady hand is pretty simple and I enjoy the clean look it gives. Sean: In regards to their armour, you achieve a great beaten up battle worn effect without making it look messy, something I personally want to be able to do myself. How do you go about painting the armour panels? Chris: This is great as you're picking up on all the things I like about my army. As you say, I wanted a weathered look without it being dirty/messy etc. I'm not saying these effects can't look good, I just prefer my models to have a bright, almost cartoony, look to them. For the black armour plates, I firstly tidy them up after painting the skin before lining all the panels with grey, all the armour is very highly detailed with lots of ridges and beaten dents. Mechanicus Standard Grey is my choice here. To start with I add a lot of black to the mix, the second layer brings in more grey before a very fine, thin line around all the ridges and dents with pure grey. I also apply some Leadbelcher to larger areas I plan to chip at this point. Then, I cover it all in Army Painter Dark Tone wash. So again, you could describe my style as inefficient as the wash takes down about the top two layers of grey. Also with what comes next you barely see what's left anyway...especially with my terrible photos!! I will say, I did try the chipping over a flat black and it just didn't look right, so I maintain the above is necessary (if only to preserve my own sanity). The actual chipping is super easy, it just takes time. The only colour I use is Runefang Steel and, in the immortal words of Duncan Rhodes, just work my way around the model(! ), applying small brushstrokes to simulate the chipped plates. I vary up the style of the strokes, from long thin lines to almost a dotted effect. I do all this with a normal brush which I think is key to keeping it clean and bright. You could do something similar with drybrushing or stippling, but for the most part would be duller, less controlled and has a tendency to look messy at times. Sean: If you could do a quick basing guide, like a paint splatter in White Dwarf, what steps would it be? *Neatly paint Rhinox Hide in the bigger cracks where the drybrushing has crossed the line. That's it! It's a really easy and simple basing method, just takes a bit of time and care. Much like the chipping. Sean: I’m guessing this army is your labour of love. How many hours you think you have put into this so far? 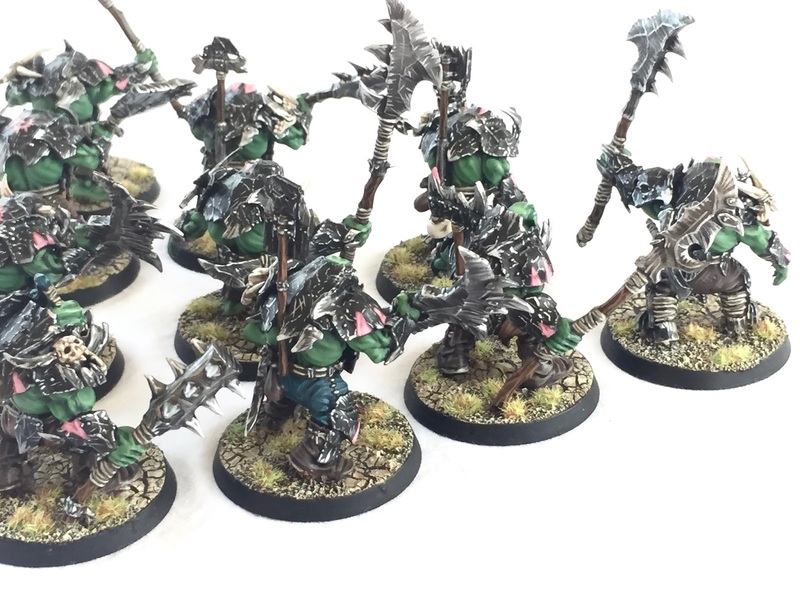 What else do you have planned for the Ironjawz? Chris: Yeh it really is a labour of love. I've not done an army to this level since my Dark Elves (WFB), so it's been a really nice & self motivating feeling to connect like that with an army again. I'd love to be able to take a guess at the number of hours I've put in, but I literally can't. I wish I had kept a log to be honest, that would be super interesting. It's kind of deceptive though as purely on days/weeks, the army came together "quickly" so from the outside it may have seem like it didn't take me long. However the number of hours and ridiculously late nights within those days/weeks would be scary. Just think of a number that you consider to be a lot; its taken slightly more hours than that! 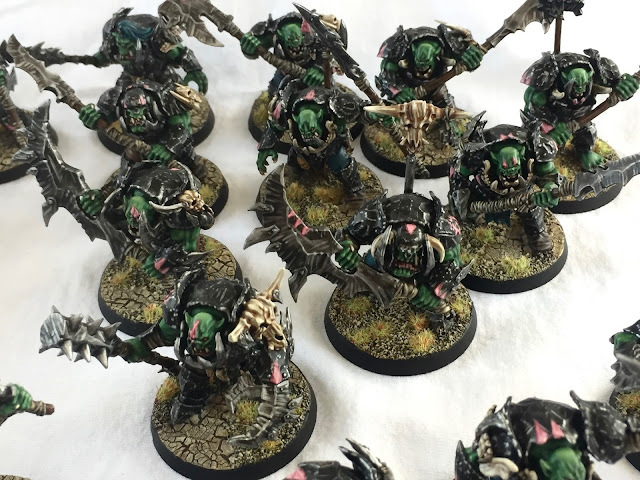 Sean: What next for the Ironjawz? Chris: Well, quite a lot really. Since I first gave you these answers (yes reader, it's taken me forever to take these awful photos!) 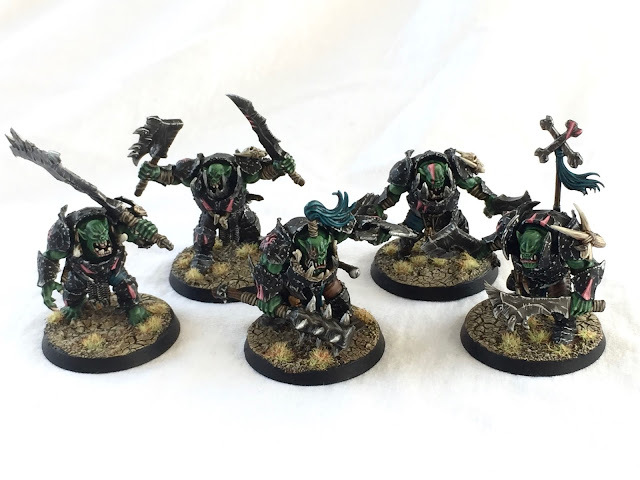 I painted another 10 Brutes (taking me to 30) and a 2nd Warchanter for Clash! On top of that I have a 3rd Warchanter, 6 more Gore-Gruntas & 20 Ardboys. 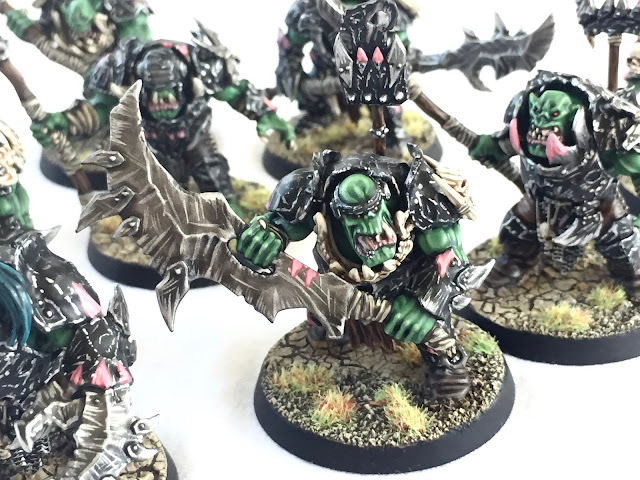 I also have plans for a second Megaboss on foot and have started acquiring Bloodbowl Orcs for some variant Ardboy conversions. Sean: I know you are looking into branching out to other areas of Destruction. What are next plans for this? Chris: I am planning a foray into Destruction as a Grand Alliance. 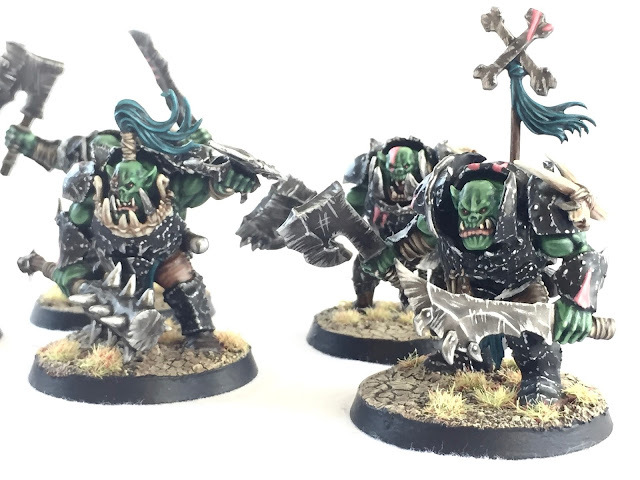 The idea here is to make sure everything ties in with the Ironjawz aesthetically. I want an almost post-apocalyptic, dieselpunk look to some of the stuff. Battered iron plates, ramshackle looking tech etc. I guess that's the way I see the army fluffwise and thematically. I dunno how that sits with the official lore, but I don't really care. 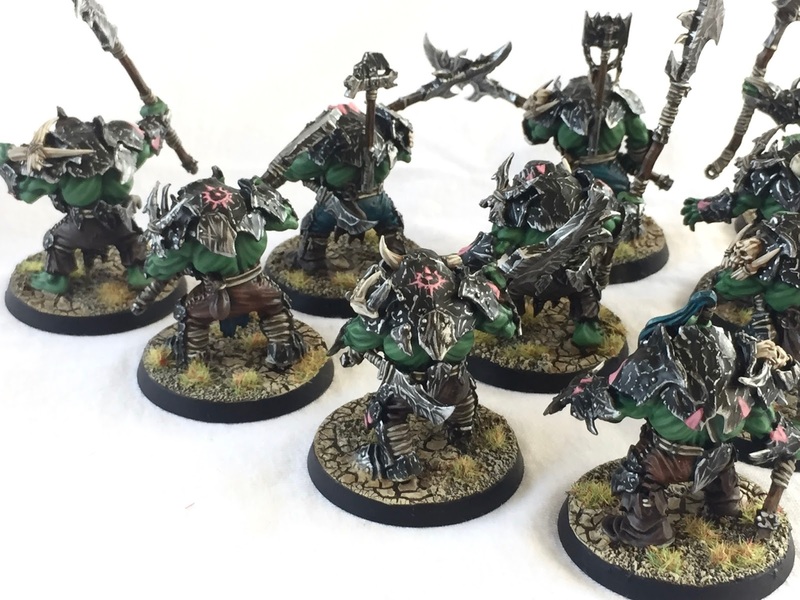 One of the beauties of AoS is the open ended realms, what's to say my Orruks couldn't be like this? The first thing I need to do before I get over excited by Destruction is some generic battleline. I'm going with 3x 10 Ardboy Yoofz, using the Savage Orruk rules and models as a base. I'm replacing as much of the bone/stone bits with metal, giving them plasticard armour playing etc. I did a test model, I'll include a photo of that as well. Converting and painting 30 of these will be time consuming, but once done I will add some Big Stabbas, Rogue Idol of Gork (made from a 40k Gorkanaut) and a Wyvern amongst other things. 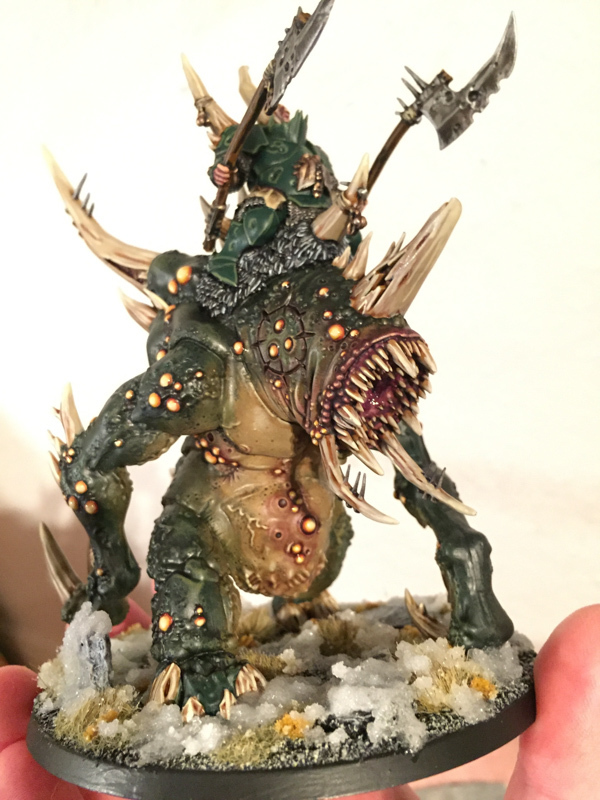 Sean: What ever happened to your Nurgle army, I loved the Varanguard Conversion! Chris: Haha yeh, they were cool right? I finished up a bunch of bits and they are in my display cabinet. The General's Handbook killed the army due to battleline requirements unfortunately. The army was really poor on the table, but looked nice, so is a bit of a shame. I picked up some old metal Ungor to use as battleline and do intend to revisit and finish this project and it would be great to see if finished...also, all that money spent on the Blightking Varanguard. Urgh. Sean: Whats the AoS scene like around your local area, do you get to casually game much? Chris: Yeh, it's pretty awesome tbh. 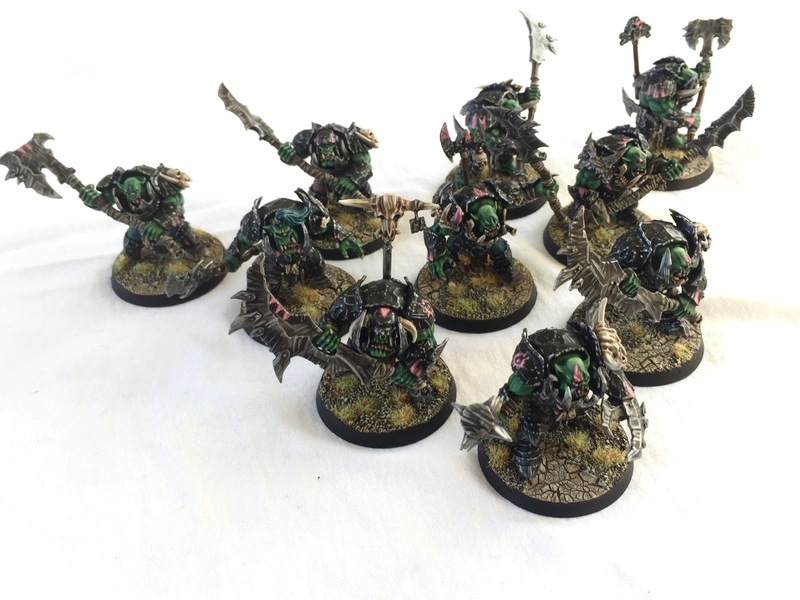 There is a local club run in Dorchester by Paul Buckler (@WarhammerGC), that due to the power of media is now known as the Dorset Doggers! They meet every Thursday & Sunday so plenty of casual gaming opportunities...unfortunately I seem to be permanently painting at the moment, so not so much for me. We've also started a modified Path to Glory campaign in the Bournemouth area, featuring my Ironjawz. You can follow that on twitter as well @AscendencyAoS. Sean: How much on a scale of 1 to Hard are you for GW right now? Chris: So so hard man! I've been playing Warhammer since the back end of 4th edition WFB and I honestly cannot remember a better time to be in the hobby. Both the models and the game are at an all time high and we also have this amazing community going. Phenomenal. Sean: What have you got to promote? 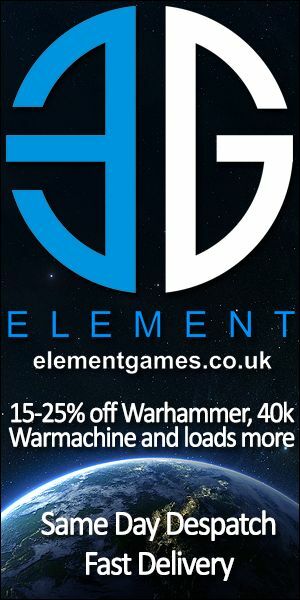 What have you got in the pipeline for BlackSun, tournaments etc? Chris: Yeh, the podcast has slowed down a bit recently. Once again painting is taking up so much of my spare time and it takes a fair while to get it all together with the editing, music etc. 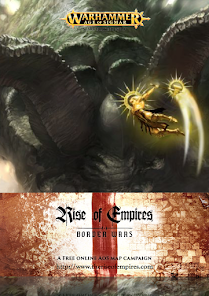 I have recently put out a fun chat I had with Rob Symes from GW about the upcoming Warhammer Live. We are currently on episode 99 and are working out what to do with the 100th show. There are some changes planned for next year, but it's all good. Check it out at www.theblacksun.co.uk or on iTunes. Tournament wise it's been one of my busiest years (definitely my best) and I'm wrapping it up nicely helping my friend Paddy run Age of Santa in Cardiff, in fact I'll be there now by the time you read this. Next year we've already got Partners in Chaos, Sheffield Slaughter and many others to look forward to, including a trip to America in January for Waaagh! Paca, which should be awesome. I'll also be running a 2 day event on 25-26th March (my birthday!! ); Tomorrow Burns! That'll be a blast. Sean: Where can people find you online, disregarding the gay dating sites? Thanks so much, speak to you again. So thats it guys! A great interview about a fantastic unit! 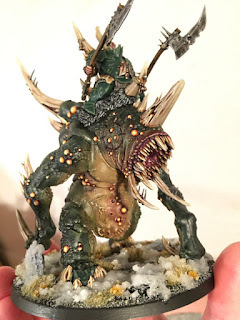 If you would like to follow Chirs' blog please visit Da Black Sunz and follow Chris on Twitter at https://twitter.com/the_black_sun. 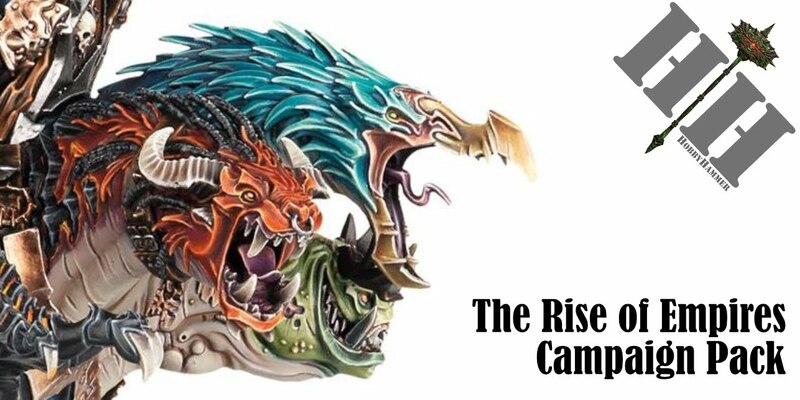 Also do not forget to download and subscribe to his podcast The Black Sun for up to date excellent funny coverage on all things Age of Sigmar!